Stoically, Cazare added, “If I am burned out, I got a tent.” What he did for the last three days was play a lot of music, and what he grabbed on the way out was a guitar. At the line of returning vehicles, I also met the same older woman I talked to on Sunday at the Golden Acorn Casino. She was very happy to know that she did not lose her house, and looked forward to getting back home. We said our goodbyes; and she, and her husband, with their cats, went home. We also met an older gentleman, Sam Mason, who just wanted to get home. He has a horse who is sick and needs feeding three times a day. Gregg Curtis told us that he was lucky not to have burned out. 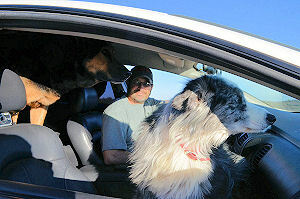 He is a neighbor to the man who perished; and in the front of the car was “Aussie Girl.” She is a dog that belonged to the man who perished, and now Gregg has three dogs to take care of. Such is life in the back country. As we moved on down to Boulevard, we found the Ray family, who unfortunately lost all their possessions. We took with us a few plush toys, and we gave one to his young son, about two. We also lent them a military folding shovel, so they could look for “a rock that came from the Trail of Tears,” a reference to the displacement of Native Americans over a century ago. Soon fire officials came to check on them and help. Unfortunately this precious family heirloom was not found. Ray, who wouldn’t provide his full name, had a major complaint. He saw the media get to the fire line faster than the fire service. He knew that his house would probably burn, due to that and he was understandably angry at both the media and fire personnel. We made a hasty exit. 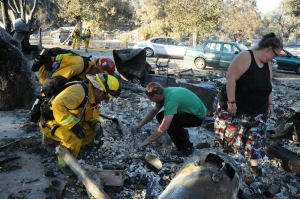 He, and his family were to stay in a tent around what remains of their belongings. The small home, little more than a shack, they all lived in is gone. The home is insured, but they rent, and their belongings were not. So they head on to an uncertain future. Now to the status of the fire, CalFire has now confirmed the loss of 11 homes and additional outbuildings. Two firefighters were reported injured. The charred body found at a home is believed to be that of Carson Robinson, an elderly resident who did not evacuate after reverse 911 calls were made to the area. Returning residents should also be aware that fire personnel will remain in the area on patrol, so be aware of their presence. Law enforcement will also be in the area to prevent looters from preying on fire victims. Returning residents also have to be aware of hazards. Watch for fallen power lines, as well as other utilities. Moreover, be aware of hot spots and if you need help, please contact firefighters or police in the area. 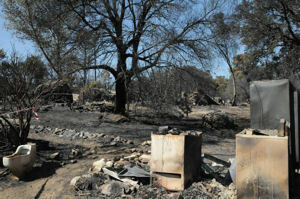 Moehler added that Tierra del Sol had not burned in years and not seen this level of devastation either. 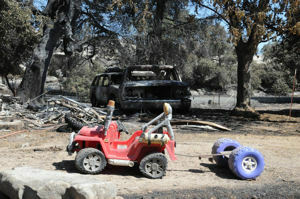 He added that this was a fast, wind-driven fire, and fire personnel had to play catch-up to get a handle on it. By later today, if things go well, they will start to release personnel. Moreover, the American Red Cross also will keep the shelter open at least through today. On a very personal note, an ECM reader posted a note on a story on our website seeking help to find a resident, the relative of a friend of his who had not been heard from since the fire began. I took the liberty to contact the reader and advise him to contact the American Red Cross disaster services. The American Red Cross, like all Red Cross national societies, does family reunification during a disaster. It is one of the mandates of the Red Cross. I knew this since I was a Mexican Red Cross Volunteer Paramedic for ten years, and did disaster relief was well. I was pleased to learn that this actually happened and that these family members were brought back together.